Saturday Night Market in Thongsala! Every Saturday from 5 pm the Chinese Street in Tongsala gets full of people from all over the island. The street gets full of lively families who sets up shops or walk around saying their hello's to everyone they didn't see for the last week. Food stands and gadget shops together with juice or tea bars and live music with locals playing, cd stands, jewelry, shoes, second hands, bugs, spiders, scorpions, fruits and massage! The Market is consisting of varieties of art items, souvenirs, clothing and accessories, groceries, food, decorations, all kinds of Snacks and a very alive environment. Many stands & small shops all along the road, all offering a variety of everything WITH accessories and of course delicious Thai food. Bugs & Creepy Crawlies in big Frying Pans along with Flying Ants in honey. Spiders, Scorpions & Scentipee's for your Snack Attacks during the day! It's called a night market, but in real time life its maybe more what you would call an evening market. From 5 pm to 10 pm. 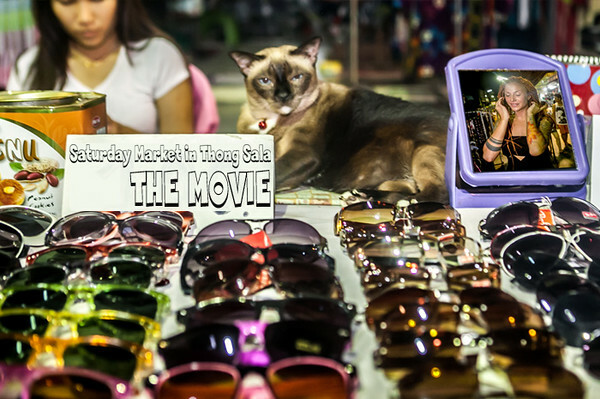 That means that in Thailand the market will always be moonlighted by the end of the evening. Sun goes down at 6 or 7 pm and at 9 pm the stars are out and shining in symphony with the Moon! So a Night Market it is ! 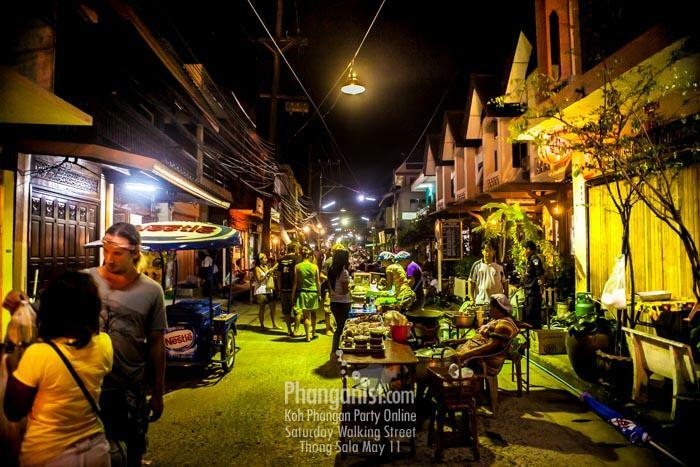 Come to enjoy a Local Feeling on the Saturday Walking Street in Tongsala. You'll find the market easy! Coming from the main road from Ban Tai - you can't help but drive directly into the Walking street. They WILL stop you if you are driving, but then you for sure also know where it is! Just get to Thongsala and you will easily see it! See you soon for traditional Thai experience on Phangan! The Chinese street in Thong Sala is located on your right when come out from Thong Sala main pier. If you arrive from Haad Rin or Baan Tai you can't miss the happening, cause it is on the Main Road right where the turn to Thong Sala village is.